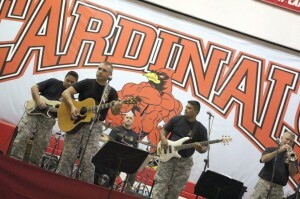 Sheldon Clark JROTC held the “Stars and Stripes “concert this past weekend . The JROTC event included several performers including the 113 Army Band, Tyler Stephens and Sheldon Clarks Dance team performing 2 outstanding dances led by Mrs. Tracy Mann. SCHS JROTC’s Cadet Madison Mooney was the Master of Ceremonies ensuring that each performer was introduced and thanked for their contributions to the overall concert. SCHS JROTC instructor Sergeant Rodriguez stated” he was extremely proud of all the cadets whom made this concert happen by coordinating and planning the entire event”. SCHS JROTC would like to thank all the community members who assisted with the concert, and send a special thanks to Mrs. Harless, Martin County Kiwanis, and all the JROTC parents who helped to ensure it was a success. To see many more pictures please visit the JROTC webpage. Coal Economy Hurting; Are Layoffs and Shut Downs a Trend?